Records are meant to be broken — at least, that’s what many people say. It’s certainly the case in the fast-developing solar energy industry. Tons of research teams around the world are working on improving solar technology — within universities, governmental research institutes, and companies. It seems there’s a new solar efficiency record of one type or another being set every month. 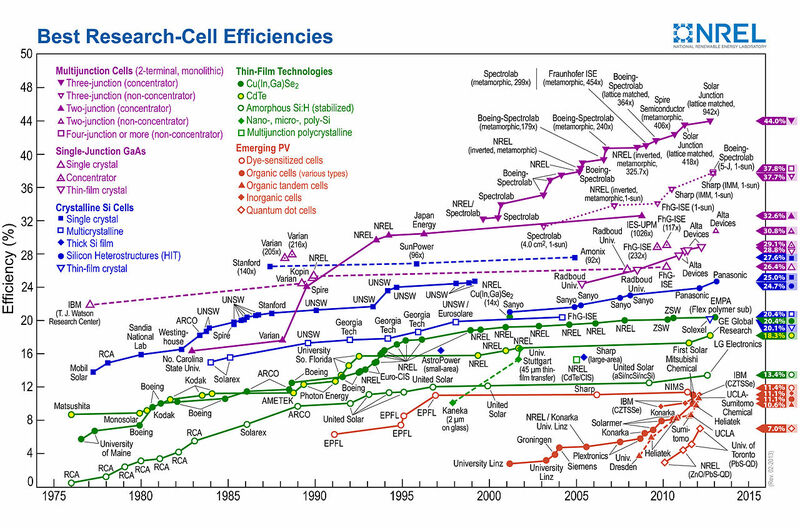 You might notice in that graph that Panasonic has a few records in recent years (check out the blue line for crystalline silicon solar cells). Most recently, Panasonic has claimed a 24.7% world efficiency record for such solar technology. It was reportedly verified by Japan’s Institute of Advanced Industrial Science and Technology. Structure of Panasonic’s record-breaking HIT solar cell. The Panasonic HIT solar cell has a surface area of 101.8cm². Panasonic applies a stack cell approach, where an amorphous silicon (a-Si) layer is in place on top of a monocrystalline silicon (c-Si) substrate. Key to Panasonic’s technology, the company claims, is that it’s a-Si application is done so without damaging the c-Si substrate. The result is an open voltage improvement from 0.748 V to 0.750 V, according to the company statement. A reduction in light loss has also been claimed as delivering the high efficiency cell, reports Panasonic, through developments with the conductive coating technology and the transparent a-Si layer. Shading is additionally minimized by reduction of the grid electrode surface area. Resistive loss has further been reduced in the Panasonic cell, with a higher aspect ratio being achieved, increasing the fill factor from 0.822 to 0.832. The aspect ratio refers to the grid electrodes’, or bus bars’, height to line width ratio. Panasonic says it will focus on applying this laboratory technology in mass production. The Wall Street Journal’s Market Watch reports Panasonic’s mass-market cells can reach efficiencies of up to 21.6%. It continues that Panasonic has commenced photovoltaic cell production in Malaysia, where it hopes to reduce costs by 20%. The previous record for an applicable c-Si cell was 24.2% achieved by SunPower, as reported by SolarPlaza.